Which chassis points would you suggest for 2017? I think it's fun to view which chassis is fast at which track. See the table below. Just imagine we would choose a scoring system where Cooper gets extra chassis points at Monza. You can lose 96 seconds per race (when the race length is about 1 hour) when you choose Cooper instead of Lotus. The number 5.757 means that Cooper "should" get 5.757 points at Monza instead of 4. 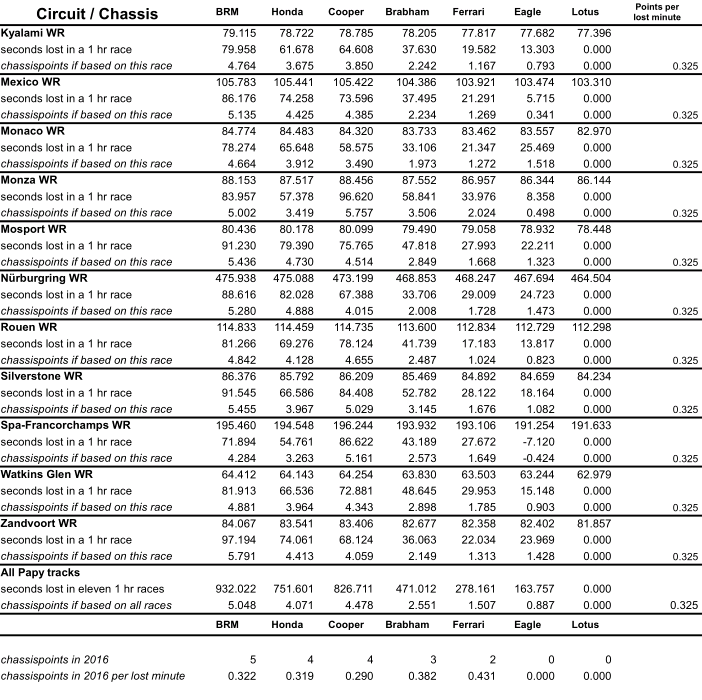 The table is based on WR laptimes from the spreadsheet GPL_HARDEST BENCHMARKS & CIRCUITS_RSC.xls made by Ducan Scheltens in 2008.
a) I always highlighted that a Brabham is undercredited and that all cars are not equally "bad" on different tracks. c) ... let's try your idea for 2017 ! I suggest we choose one of these options. And then double base and chassis points to get rounded numbers.